85. Mohammad A. Alkhadra, Andrew T. Kleinschmidt, Samuel E. Root, Daniel Rodriquez, Adam D. Printz, Suchol Savagatrup, and Darren J. Lipomi. Mechanical Properties of Semiconducting Polymers. Chapter in Handbook of Conducting Polymers, Fourth Edition, 2019. Chapter 7, pp. 249-176. 84. Julian Ramírez, Daniel Rodriquez, Armando D. Urbina, Anne M. Cardenas, and Darren J. LIpomi. Combining High Sensitivity and Dynamic Range: Wearable Thin-Film Composite Strain Sensors of Graphene, Ultrathin Palladium, and PEDOT:PSS. ACS Applied Nano Materials. ASAP article. 83. Cody W. Carpenter, Siew Ting Melissa Tan, Colin Keef, Kyle Skelil, Marigold Malinao, Daniel Rodriquez, Mohammad A. Alkhadra, Julian Ramírez, and Darren J. Lipomi. Healable thermoplastic for kinesthetic feedback in wearable haptic devices. Sensors and Actuators A 2019. Vol. 288, pp. 79-85. 82. Laure V. Kayser and Darren J. Lipomi, 2019. 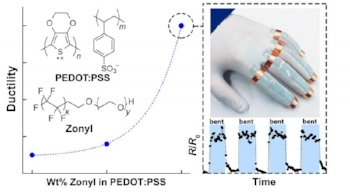 Stretchable Conductive Polymers and Composites Based on PEDOT and PEDOT:PSS. Advanced Materials. 1806133. 81. Andrew T. Kleinschmidt and Darren J. Lipomi, 2018. Stretchable Conjugated Polymers: A Case Study in Topic Selection for New Research Groups. Accounts of Chemical Research. 51:3134-3143. 80. Elizabeth L. Melenbrink, Kristan M. Hilby, Mohammad A. Alkhadra, Sanket Samal, Darren J. Lipomi, and Barry C. Thompson, 2018. Influence of Systematic Incorporation of Conjugation-Break Spacers into Semi-Random Polymers on Mechanical and Electronic Properties. ACS Applied Materials & Interfaces. 10:32426-32434. 78. Daniel Rodriquez, James G. Kohl, Pierre Morel, Kyle Burrows, Grégory Favaro, Samuel E. Root, Julian Ramírez, Mohammad A. Alkhadra, Cody W. Carpenter, Zhuping Fei, Pierre Boufflet, Martin Heeney, and Darren J. Lipomi, 2018. Measurement of Cohesion and Adhesion of Semiconducting Polymers by Scratch Testing: Effect of Side-Chain Length and Degree of Polymerization. ACS Macro Letters, 7:1003-1009. 77. Fumitaka Sugiyama, Andrew T. Kleinschmidt, Laure V. Kayser, Daniel Rodriquez, Mickey Finn III, Mohammad A. Alkhadra, Jeremy M.-H. Wan, Julian Ramírez, Andrew S.-C. Chiang, Samuel E. Root, Suchol Savagatrup, and Darren J. Lipomi, 2018. 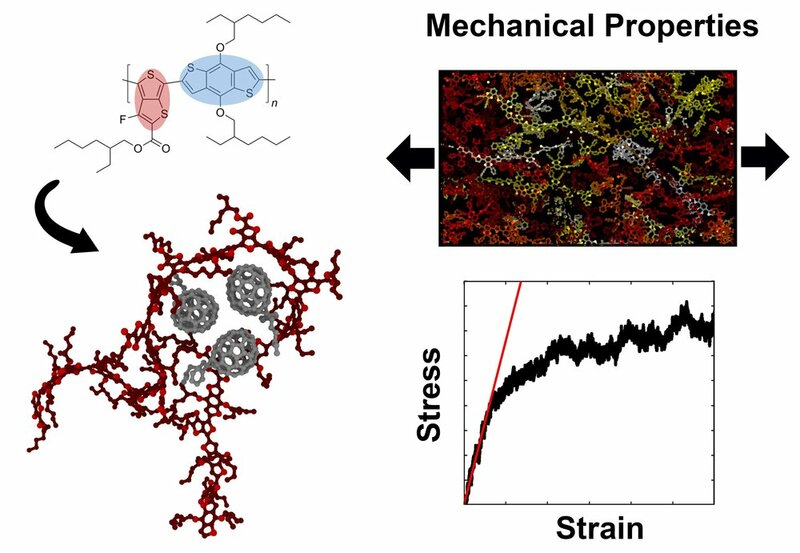 Effects of flexibility and branching of side chains on the mechanical properties of low-bandgap conjugated polymers. Polymer Chemistry, 9:4354-4363. 76. Fumitaka Sugiyama, Andrew T. Kleinschmidt, Laure V. Kayser, Mohammad A. Alkhadra, Jeremy M.-H. Wan, Andrew S.-C. Chiang, Daniel Rodriquez, Samuel E. Root, Suchol Savagatrup, and Darren J. Lipomi, 2018. Stretchable and Degradable Semiconducting Block Copolymers. Macromolecules, 51:5944-5949. 75. Charles Dhong, Samuel J. Edmunds, Julian Ramírez, Laure V. Kayser, Fang Chen, Jesse V. Jokerst, and Darren J. Lipomi, 2018. Optics-Free, Non-Contact Measurements of Fluids, Bubbles, and Particles in Microchannels Using Metallic Nano-Islands on Graphene. Nano Letters, 18:5306-5311. 74. Laure V. Kayser, Madeleine D. Russell, Daniel Rodriquez, Sami N. Abuhamdieh, Charles Dhong, Salik Khan, Alexander N. Stein, Julian Ramírez, and Darren J. Lipomi, 2018. RAFT Polymerization of an Intrinsically Stretchable Water-Soluble Block Copolymer Scaffold for PEDOT. Chemistry of Materials. 30:4459-4468. 73. Julian Ramírez, Daniel Rodriquez, Fang Qiao, Julian Warchall, Jasmine Rye, Eden Aklile, Andrew S.-C. Chiang, Brandon C. Marin, Patrick P. Mercier, C. K. Cheng, Katherine A. Hutcheson, Eileen H. Shinn, and Darren J. Lipomi. Metallic Nanoislands on Graphene for Monitoring Swallowing Activity in Head and Neck Cancer Patients. ACS Nano 2018. Vol. 12, pp. 5913-5922. 72. Yang Shi, Hanmei Tang, Shengli Jiang, Laure V. Kayser, Mingqian Li, Fang Liu, Fei Ji, Darren J. Lipomi, Shyue Ping Ong, and Zheng Chen. Understanding the Electrochemical Properties of Napthalene Diimide: Implication for Stable and High-Rate Lithium-Ion Battery Electrodes. Chemistry of Materials 2018. Vol. 30. pp. 3508-3517. 71. Samuel E. Root, Cody W. Carpenter, Laure V. Kayser, Daniel Rodriquez, Daniel Davies, Shen Wang, Shirley Meng, and Darren J. Lipomi. Ionotactile Stimulation: Nonvolatile Ionic Gels for Haptic Human-Machine Interfaces. ACS Omega 2018. Vol. 3, pp. 662-666. 70. Darren J. Lipomi. Organic photovoltaics: Focus on its strengths. Joule 2018. In press. 69. Cody W. Carpenter,* Charles Dhong,* Nicholas B. Root,* Daniel Rodriquez, Emily E. Abdo, Kyle Skelil, Mohammad A. Alkhadra, Julian Ramírez, Vilayanur S. Ramachandran, and Darren J. Lipomi. 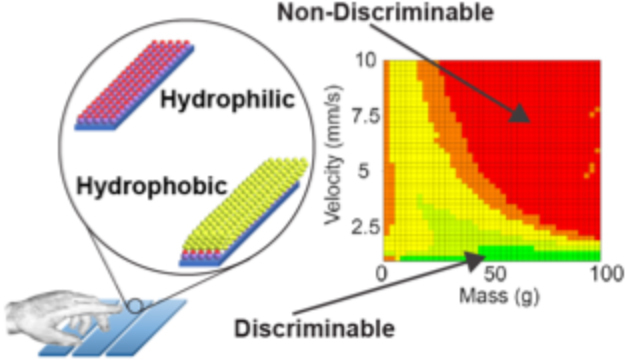 Human ability to discriminate surface chemistry by touch. Materials Horizons 2018. Vol. 5, pp. 70-77. 68. Mohammad A. Alkhadra, Samuel E. Root, Kristan M. Hilby, Daniel Rodriquez, Fumitaka Sugiyama, and Darren J. Lipomi. Quantifying the Fracture Behavior of Brittle and Ductile Thin Films of Semiconducting Polymers. Chemistry of Materials 2017. Vol. 29, pp. 10139–10149. 67. Ishan D. Joshipura, Mickey Finn III, Siew Ting Melissa Tan, Michael D. Dickey, and Darren J. Lipomi. 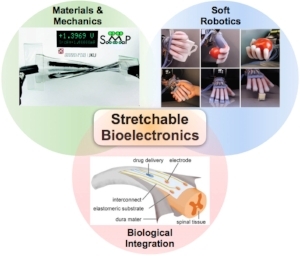 Stretchable bioelectronic–Current and future. MRS Bulletin 2017. Vol. 42, pp. 960-967. 66. Brandon C. Marin, Julian Ramirez, Samuel E. Root, Eden Aklile, and Darren J. Lipomi. Metallic nanoislands on graphene: A metamaterial for chemical, mechanical, optical, and biological applications. Nanoscale Horizons. 2017. Vol. 2, pp. 311-318. 65. Mickey Finn, Christian Martens, Aliaksandr V. Zaretski, Berenger Roth, Roar Sondergaard, Frederik C. Krebs, and Darren J. Lipomi. 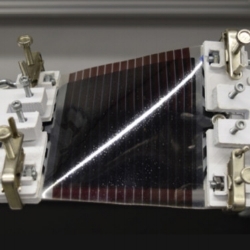 Mechanical stability of roll-to-roll printed solar cells under cyclic bending and torsion. Solar Energy Materials & Solar Cells. 2018, Vol. 174, pp. 5-15. 64. Liban Jibril, Julian Ramirez, Aliaksandr Zaretski, and Darren J. Lipomi. Single-Nanowire strain sensors fabricated by nanoskiving. Sensors & Actuators A. Physical 2017. Vol. 263, pp. 702-706. 63. Timothy F. O'Connor, Matthew Fach, Rachel Miller, Samuel E. Root, Patrick P. Mercier, and Darren J. Lipomi. The Language of Glove: Wireless gesture decoder with low-power and stretchable hybrid electronics. PLoS One 2017. DOI: 10.1371/journal.pone.0179766. Comment: Cultural considerations and terminology surrounding American Sign Language in materials research. 62. Samuel E. Root, Suchol Savagatrup, Adam D. Printz, Daniel Rodriquez, and Darren J. Lipomi. Mechanical Properties of Organic Semiconductors for Stretchable, Highly Flexible, and Mechanically Robust Electronics. Chemical Reviews 2017. Vol. 117, pp. 6467–6499﻿. Editor's Choice, Free Open Access. 61. Samuel E. Root,* Mohammad A. Alkhadra,* Daniel Rodriquez, Adam D. Printz, and Darren J. Lipomi. Measuring the Glass Transition Temperature of Conjugated Polymer Films with UV-vis Spectroscopy. Chemistry of Materials 2017, Vol. 29, pp. 2646-2654. *Equal contribution. 60. Daniel Rodriquez, Jae-Han Kim, Samuel E. Root, Zhuping Fe, Pierre Boufflet, Martin Heeney, Taek-Soo Kim,* and Darren J. Lipomi. * Comparison of methods for determining the mechanical properties of semiconducting polymer films for stretchable electronics. ACS Applied Materials & Interfaces 2017, Vol. 9, pp. 8855-8862. 59. Brandon C. Marin, Samuel E. Root, Armando Urbina, Eden Aklile, Rachel Miller, Aliaksandr V. Zaretski, and Darren J. Lipomi. Graphene-metal composite sensors with near-zero temperature coefficient of resistance. ACS Omega 2017. Vol. 2, pp. 626-630. 58. Darren J. Lipomi and Zhenan Bao. Stretchable and ultra-flexible organic electronics. MRS Bulletin 2017. Vol. 42, pp. 93-97. 57. Brandon C. Marin, Justin Liu, Eden Aklile, Armando Uribina, Andrew S-C. Chiang, Natalie Lawrence, Shaochen Chen, and Darren J. Lipomi. SERS-Enhanced piezoplasmonic graphene composite for biological and structural strain mapping. Nanoscale 2017. Vol. 9, pp. 1292-1298. 56. Samuel E. Root, Nicholas Jackson, Suchol Savagatrup, Gaurav Arya, and Darren J. Lipomi. Modelling the morphology and thermomechanical behaviour of low-bandgap conjugated polymers and bulk heterojunction films ﻿Energy & Environmental Science 2017, Vol. 10, pp. 558-569. Selected by the editors as a HOT Article for 2017. Open-source code can be found at this site maintained by Sam Root. 55. Andrew T. Kleinschmidt, Samuel E. Root, and Darren J. Lipomi. Poly(3-hexylthiophene) (P3HT): Fruit Fly or Outlier in Organic Solar Cell Research? Journal of Materials Chemistry A 2017, Vol. 5, pp. 11396-11400. Invited for Emerging Investigators Issue. 53. Suchol Savagatrup, Xikang Zhao, Esther Chan, Jianguo Mei, and Darren J. Lipomi. 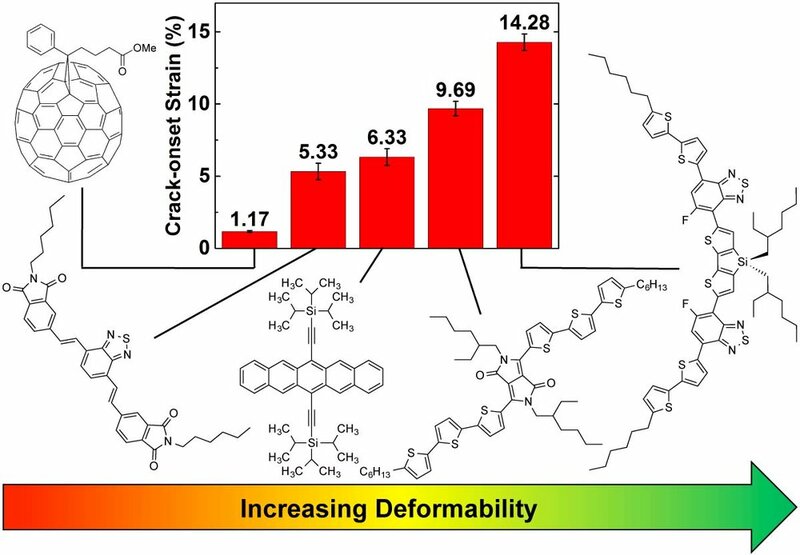 Effect of Broken Conjugation on the Stretchability of Semiconducting Polymers. Macromolecular Rapid Communications 2016, Vol. 37, pp. 1623-1628. 52. Daniel Rodriquez, Suchol Savagatrup, Eduardo Valle, Christopher M. Proctor, Caitlin McDowell, Guillermo C. Bazan, Thuc-Quyen Nguyen, and Darren J. Lipomi. Mechanical Properties of Solution-Processed Small-Molecule Semiconductor Films. ACS Applied Materials & Interfaces 2016, Vol. 8, pp. 11649–11657﻿. 51. Adam D. Printz and Darren J. Lipomi. Competition between Deformability and Charge Transport in Semiconducting Polymers for Flexible and Stretchable Electronics. Applied Physics Reviews 2016, Vol. 3, pp. 021302. 50. Timothy F. O'Connor, Suchol Savagatrup, and Darren J. Lipomi. Soft power: Stretchable and ultra-flexible energy sources for wearable and implantable devices. Invited for: Stretchable Bioelectronics for Medical Devices and Systems. John A. Rogers, Dae-Hyeong Kim, and Roozbeh Ghaffari, Editors. Springer, 2016. 49. Samuel E. Root, Suchol Savagatrup, Christopher J. Pais, Gaurav Arya, and Darren J. Lipomi. Predicting the Mechanical Properties of Organic Semiconductors Using Coarse-Grained Molecular Dynamics Simulations. Macromolecules 2016, Vol. 49, pp. 2886-2894. 48. Adam D. Printz, Andrew S.-C. Chiang, Suchol Savagatrup, and Darren J. Lipomi. Fatigue in Organic Semiconductors: Spectroscopic Evolution of Microstructure due to Cyclic Loading in Poly(3-Heptylthiophene). Synthetic Metals 2016, Vol. 217, pp. 144-151. 47. Eric J. Sawyer, Aliaksandr V. Zaretski, Adam D. Printz, Nathaniel V. de los Santos, Alejandra Bautista-Gutierrez, and Darren J. Lipomi. Large Increase in Stretchability of Organic Electronic Materials by Encapsulation. Extreme Mechanics Letters 2016, Vol. 8, pp. 78-87. 46. Bérenger Roth,† Suchol Savagatrup,† Nathaniel De Los Santos, Ole Hagemann, Jon E. Carlé, Martin Helgesen, Francesco Livi, Eva Bundgaard, Roar R. Søndergaard, Frederik C. Krebs, and Darren J. Lipomi. Mechanical Properties of a Library of Low-Bandgap Polymers. Chemistry of Materials 2016, Vol. 28, pp. 2363-2373. †﻿Equal contribution. 45. Aliaksandr V. Zaretski, Samuel E. Root, Alex Savchenko, Elena Molokanova, Adam D. Printz, Liban Jibril, Gaurav Arya, Mark Mercola, and Darren J. Lipomi. Metallic Nanoislands on Graphene as Highly Sensitive Transducers of Mechanical, Biological, and Optical Signals. Nano Letters 2016, Vol. 16, pp. 1375-1380. ﻿44. Darren J. Lipomi. 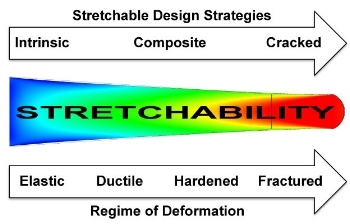 Stretchable Figures of Merit for Deformable Electronics. Advanced Materials. 2016. Vol. 28, pp. 4180-4183. 43. Timothy F. O’Connor, Aliaksandr V. Zaretski, Suchol Savagatrup, Adam D. Printz, Cameron D. Wilkes, Mare Ivana Diaz, Eric J. Sawyer, and Darren J. Lipomi. ﻿Wearable organic solar cells with high cyclic bending stability: Materials selection criteria. Solar Energy Materials and Solar Cells 2016, Vol. 144, pp. 438-444. 42. Adam D. Printz, Aliaksandr V. Zaretski, Suchol Savagatrup, Andrew S-C. Chiang, and Darren J. Lipomi. Yield point of semiconducting polymer films on stretchable substrates determined by onset of buckling. ACS Applied Materials & Interfaces 2015, Vol. 7, pp. 23257-23264. 40. Aliaksandr V. Zaretski and Darren J. Lipomi. Processes for non-destructive transfer of graphene: widening the bottleneck for industrial scale production. Nanoscale 2015, Vo. 7, pp. 9963-9969. 39. Timothy F. O'Connor, Kirtana M. Rajan, Adam D. Printz, and Darren J. Lipomi. Toward organic electronics with properties inspired by biological tissue. Journal of Materials Chemistry B 2015, Vol. 3, pp. 4947-4952 (see article for image credits). 38. Suchol Savagatrup,†﻿ Adam D. Printz,†﻿ Haosheng Wu, Kirtana M. Rajan, Eric J. Sawyer, Aliaksandr V. Zaretski, Christopher J. Bettinger, and Darren J. Lipomi. Viability of stretchable poly(3-heptylthiophene) (P3HpT) for organic solar cells and field-effect transistors. Synthetic Metals 2015, Vol. 203, pp. 208-214. †﻿Equal contribution. 31. See publications at Stanford. 30. Suchol Savagatrup, Adam D. Printz, Timothy F. O'Connor, Aliaksandr V. Zaretski, and Darren J. Lipomi "Molecularly Stretchable Electronics" Chemistry of Materials 2014, Vol. 26, pp. 3028-3041. Invited for "Up-and-Coming" researcher series. 26. Timothy F. O’Connor, Aliaksandr V. Zaretski, Bijan A. Shiravi, Suchol Savagatrup, Adam D. Printz, Mare Ivana Diaz, and Darren J. Lipomi ﻿"Stretching and Conformal Bonding of Organic Solar Cells to Non-Planar Substrates" Energy and Environmental Science 2014, Vol. 7, pp. 370-378. 25. Adam D. Printz, Esther Chan, Celine Liong, Rene Martinez, and Darren J. Lipomi "Photoresist-Free Patterning by Mechanical Abrasion of Water-Soluble Lift-Off Resists and Bare Substrates: Toward Green Fabrication of Transparent Electrodes﻿" PLoS One 2013, Vol. 8, pp. e83939.